Hot topics at the recent Satellite 2017 show in Washington, D.C. included discussions regarding new satellite constellations. This is an era of exciting growth for aeronautical satellite connectivity, with a new generation of technologies now in the advanced stages of development ready to handle the specific requirements in the airline industry. Ten years ago, having a flip phone and asking a loved one back home to check email was a sufficient way to stay connected while working offshore. Today that is not the case. 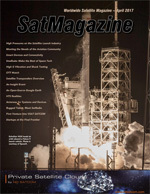 The growing popularity of the smallsats market is a testimony to the best use of evolving space technologies in today’s world. Increasingly higher G levels required for vibration and SRS shock testing for aerospace and space customers is being experienced by Experior Laboratories—presented here are test levels that the company has been able to routinely perform, using high performance Unholtz-Dickie T2000 Shakers and a state-of-the-art Kinetic Impact Pyroshock Simulation (KIPS) System. Satellite transponders are the space-based sophisticated cluster of radio repeaters, integrated into telecommunication satellite. The commercial space industry is on the cusp of a new era in satellite performance. In the past two years, multiple commercial satellite operators have begun launching high-throughput satellite (HTS) constellations. The motif behind antenna market evolution in the next five years is likely to be the Internet of Things (IoT). Multinet Pakistan Private Limited (Multinet) is one of the premier infrastructure and communication solution providers for leading carriers and enterprises in the Middle East region and has been providing their services to their customer for more than a decade. NewSpace companies seeking their place in a rapidly growing and demanding commercial space market will have an unmissable opportunity in late April to reach new heights.